This would be a different sorta trip for myself in '14. I would be teaming up with a fellow New England photographer and buddy renowned for his wildlife and raptor photography, Vermonter, and owner of Jericho Hills Photo - John Vose. This would work well for both of us on several levels. I've been working with John to enhance his landscape composition techniques for over a year as well as sharing locations, and this would be a great opportunity for me to soak in some techniques for shooting wildlife! In addition, splitting much of the cost between parties is an immense savings opportunity. 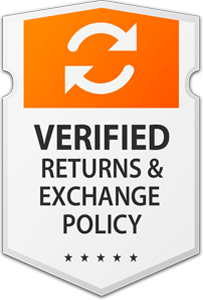 Lodging, transportation rental, and fuel consume the brunt of the expense account. Our planned itinerary dictated we stayed on the east side of GNP. Summer months this far north mean only a few hours of darkness overnight. Hitting the road and the trails at 2 a.m. to prepare for the first light of dawn (alpenglow!) are the norm. Mt. Sinopah bathed in alpenglow is a delight to behold. The waters of Two Medicine lake are rarely this calm. Luckily we had virtually no issue with haze from forest fire here. 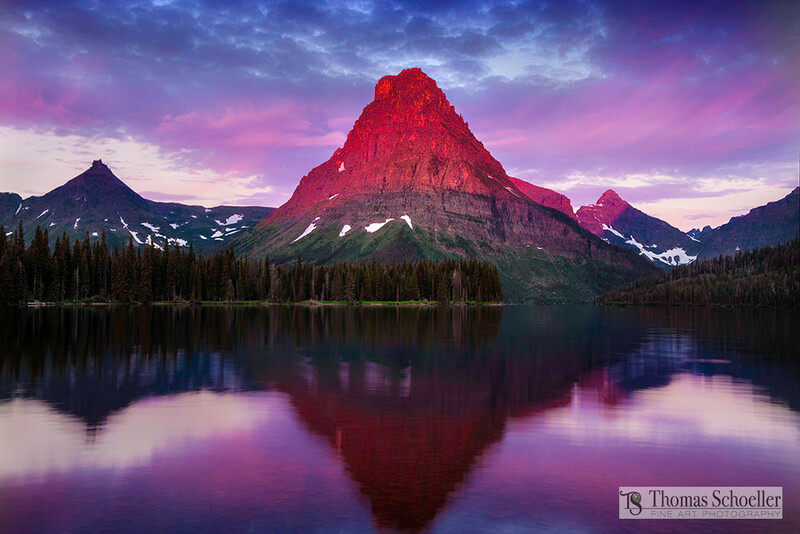 One of the challenges we were dealt with during our 2 weeks of photo sessions at Glacier National Park would prove difficult, in fact nightmarish. That would be a thick pungent haze as a result of huge swaths of forest burning in British Columbia and Washington State off to our west. I'm sorry, but not even the "haze removal tool" in Lightroom 6 can help save the day when trying to edit image files. The haze from forest fire does not resemble the magic of natural fog and mist. The first several days were the most difficult, in fact, our very first morning shooting St. Mary Lake was a complete loss. Certainly not the expected hopeful beginning to a productive session! Luckily we did not invest a lengthy hike to reach our destination, as St Mary's sunrise point was a mere few hundred feet from a parking area. We would also find early on during this trip that one of the highlighted destinations of our itinerary would be off limits due to a bear closure. Hidden Lake trail was open, but only to the observation deck. This would prove pointless for us since that was only the halfway point to our planned shooting destination. We couldn't be too angry, however. Hidden Lake had become a feeding grounds for Grizzlies due to the severity of the winter, in fact, the fields along the trails at Logan Pass were still buried in under a few feet of snow. One of our concerns before the flight was if Going-To-The-Sun-Road would even be open before we arrived! The 2014 season proved to be one of the latest road openings on record. Our planned Hidden Lake agenda will just have to wait for our next GNP sessions. We spent several afternoons at the St Mary lodge in the bar, contemplating our next assortment of options over a few Moose Drool's. It's worthy to note, it's a craft beer by the Big Sky Brewing company out of Missoula Montana and a very good friend of many outdoor photographers that shoot in Montana. St Mary's falls proved to be a beautiful spectacle of light just before sunset. Adjustments to Our Plans - Head to the Falls! 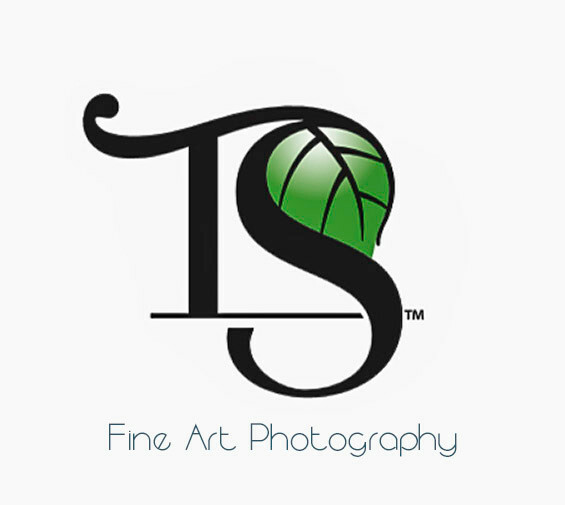 Changes were in-store to accommodate the issues we faced as professional photographers. This wasn't a family vacation, for us it's a business trip. Looking through our list of priorities, we jostled and tinkered with the schedule and made lemonade out of the lemons we were dealt. One of the long hikes we planned turned out to be exceptional, in fact, we hiked in twice. St Mary falls (above image) and Virginia Falls can be accessed by the same hiking trail that follows Virginia Creek. St Mary Falls is the first major cascades you'll encounter, it's just under a 2-mile hike in to this beauty. In researching this waterfall, I found if you arrive late day during the mid-summer the sun settles into a narrow opening between the mountains. If you're lucky, you may experience beams of light through the forest that illuminate the mist and spray over that emanates from the falls. It's pretty awe-inspiring and I'm pleased to be able to add this image to my portfolio. This is bear country, and during our many miles of hiking we encountered our share of bears. The evening I photographed this scene from St. Mary Falls, the tourist and day hikers were making a bee line back to their vehicles before it became dark. We enjoyed solitude shooting this scene, in fact, I can remember only four people heading back to the parking area as we waited for the sun to get to a very low angle before we began shooting. After our session ended we packed our gear and hiked out, only about .25 miles from the parking area and walking towards us was a family. We could hear the kids chatting as we came closer, then screams. Perhaps only 100 feet separated us at this point, my first thought was did WE startle them? Turns out a Black bear crossed the trail between both of our parties. John and I never did get to make visual contact with this bear, however, the tourist told us the bear was just a few yards away as we hiked by. They (family) were spooked by the encounter and decided to stick with us back to the road. 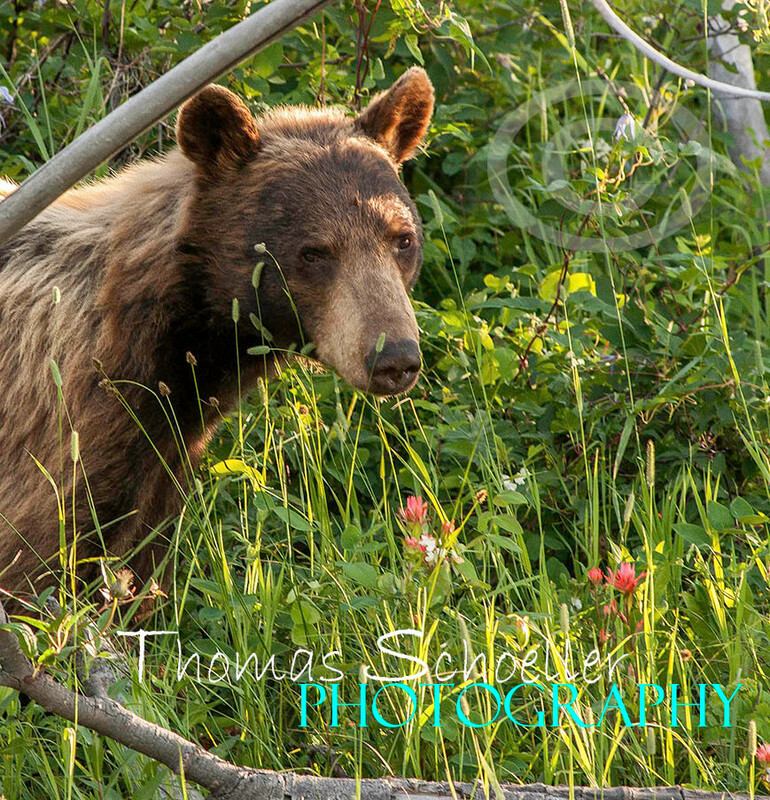 This Bruin is a cinnamon phase Black bear, one we crossed paths with along the Blackfoot Highway east of GNP. The cinnamon phase is the most popular color of Black Bears in Montana followed by all black with tan snouts. I was close enough to photograph this one with an 80-200mm F/2.8 lens. Daylight hours are commonly used by serious photographers to scout locations and take trial images (most will be deleted) to experiment with composition and plan for the sun's location for sunrise or sunsets. Bright,mid-day lighting is usually too flat for Fine Art Photography if you do this for a living. The colors are washed out and very little character in the landscape is allowed to reveal itself. Long hikes with nearly 40 lbs. of gear in backpacks are the usual for us, only to do the same hike again with the added anxiety of being on time and having great light and clouds for the planned photo sessions. Along the way, I am always keeping my eyes open for scenes that are appealing for Stock photography use, as opposed to what I am programmed to do which is Fine Art Photography. The open spaces of the American west do provide good opportunities during your travels. 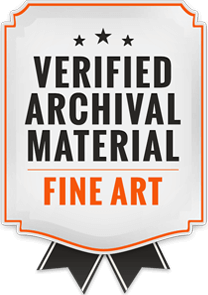 Clients seeking Stock Images are typically looking for scenes that may help sell a product, work for a website banner or any number of uses. 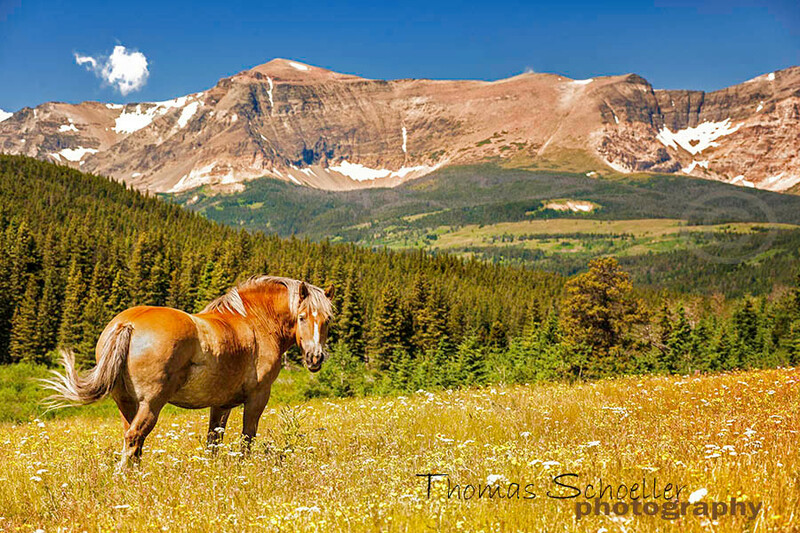 This handsome stallion was a willing model to pose in front of the majestic front range from a stunning field of wildflowers. By the end of the first week, a powerful storm front would make way through the region. John and I had spent the earlier part of the day exploring possibilities in the very remote Kintla Lake in the North Fork of Glacier. The smoke still too thick to be conducive for making art prints however we added a stunning opportunity for future sessions in Glacier! As we traversed east back through the park we would encounter drama and magical lighting high in the mountains. The timing of storm front and daylight was supurb. Storm clouds are amazing to be IN at a mile and 1/2 above sea level. The battle between light and shadow is not an ordinary light by any means. This is lighting that can define the subject and add a sense of drama that adds power to the image. We pulled over to witness such an event west of Logan Pass. Dark storm clouds dominated the scene, occasionally allowing sunlight to find it's way to illuminate parts of the mountainous landscape below. My favorite image from this battle of shadow and light was of Mt Oberlin. It was completely an unplanned event, something you need to adapt yourself to and quickly visualize in your mind. 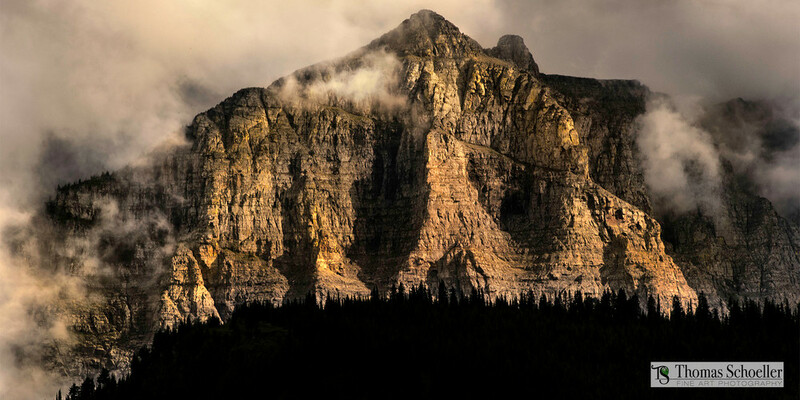 I wanted the glowing sunlit mountain to stand out in contrast to the dark storm clouds and forested ridge below the exposed granite monolith. I made well over a dozen exposures just using Oberlin as the primary subject. I was most impressed with this image, which really expressed the power I was hoping to capture. Strong shadows add emphasis to the graphic power of the glowing Mount Oberlin. Avalanche Gorge is a slot deep within the Trail of the Cedars. 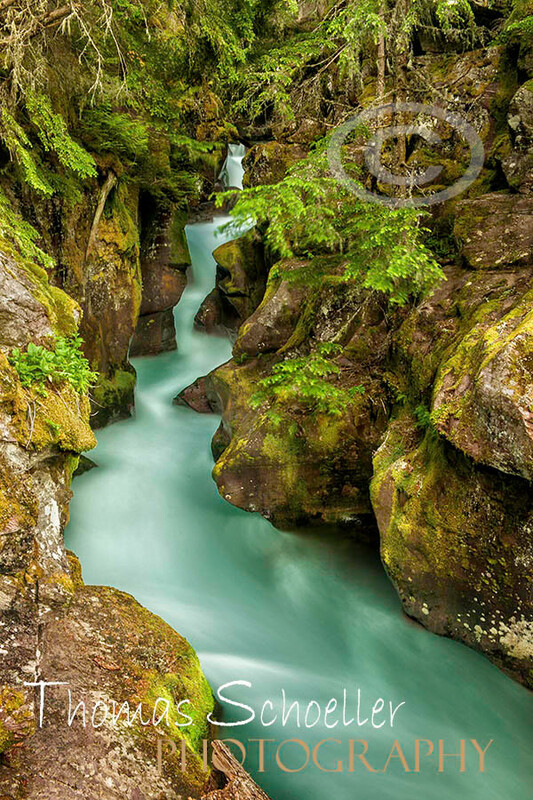 One of the many natural features hidden within Glacier Parks expansive borders. With most of the haze and smoke temporarily diverted away from the peaks and valleys of Glacier National Park we aimed our sites back at Logan Pass. Earlier during our stay, not only was the forest fire haze an issue, the deep snow pack created it's own unique set of photographic issues. At Logan Pass, we come to expect a dramatic range of wildflowers by mid-July. It wasn't until the last remaining days of our sessions the snow melted enough to reveal some of the beautiful waterfalls and stepped ledges in the hanging gardens. The remaining snow did allow for safe navigation to avoid any physical contact with the sensitive native flora. We went out of our way to stay on the white stuff and skip from boulder to boulder to find spectacular scenes to photograph. This is prime Grizzly country, bear encounters are common here. We were not eager to confront any Grizzly and during our many explorations at Logan Pass we were the ONLY human souls within sight. As much as John and I love these powerful creatures, we did not wish to interfere with their mornings or have them interfere with us getting THE shot! Luckily, this worked out nicely for everyone. John spotted the only Grizzly bears during our time here, and it was up in the Many Glacier region of the park. A mother and 2 cubs were on a hillside turning over rocks and boulders to feed on insects and grubs. 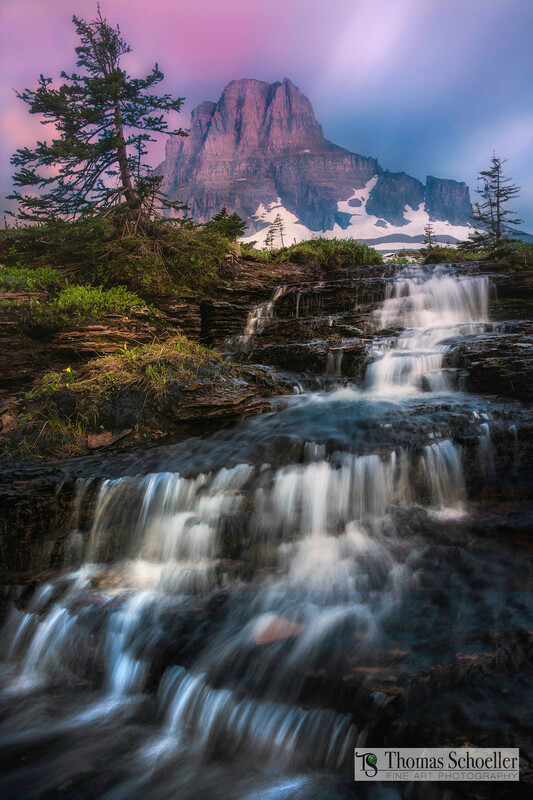 The lighting was short lived at Logan Pass, I managed to come away with 2 fine art images I considered "keepers". Both were from bracketed sets of exposures I've only recently opened and began processing. Both were from the Hanging Gardens of Logan Pass that drains into the Reynolds Creek basin. Despite being a professional at my craft, I'm still open to learning new tricks to add to my arsenal. This would include during the capture of the exposures and post processing "digital darkroom". My patience paid off, giving me time to learn new light bleed techniques as well as creative blending techniques. I've blended image files for years, despite my past experiences I've been inspired by the works of a select handful (OK, just two or three fellow photogs) that have used this really cool blending technique. In fact, they created similar techniques. One of the spectacular unnamed cascades that flow during the summer months in the Hanging Gardens of Logan Pass, Montana. I cannot emphasise enough to use extreme care when trekking through an environment as fragile as the Hanging Gardens of Logan Pass. The park service has closed the Hanging Gardens in recent years during the wildflower bloom season. The reasons behind such a rash decision seem disturbing when you dig into it. The park service seems to make up rules as they feel and this is one instance I think they have an opportunity to allow naturalist and pro photographers like myself who should prove their merits the opportunity to obtain a permit to "legally" leave the Hidden Lake trail. The legendary "Triple Falls" exist in the Hanging Gardens, Galen Rowell photographed the falls for Outdoor Photographer decades ago, and they were published on the magazine's cover. 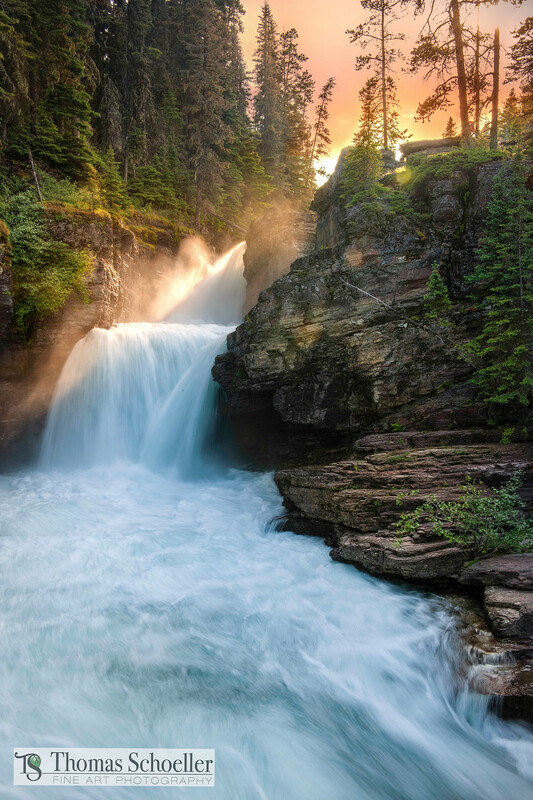 Rowell's images have become an iconic scene from Glacier Park, and the park services have used the images to influence visitors to come to the park. Seems a walkway to the falls itself may be long overdue? To this day, park rangers will look at you like they saw a sasquatch if you inquire about the whereabouts of these falls. Logan Pass is an alpine zone, the growing season here is remarkably short-lived. The typical summer tourist with a gaggle of children may not give a rip about the scarcity of the flora clinging for existence. Trampling over such fragile life is reckless, in fact, narcissistic. I've witnessed some pretty careless acts by people, enough to fill me with rage. Kids will be kids, so I blame the parents who perhaps should have left the kids who may not comprehend the devastation they are causing back with grandma and gramps at home. On the other side, I've seen fellow nature photographers consumed with passion go to extreme (careful) measures to photograph the beautiful alpine plant life to help identify the species to casual travelers and bring the issues front and center.